Star Cluster Messier 7 can be found shining brightly at the end of the tail end of the constellation Scorpius (The Scorpion). This group of stars is also known as Ptolemy's Cluster in honor of Claudius Ptolemy who discovered this star cluster around 130 AD. As the name implies, it is the 7th entry of Charles Messier's Catalog of Nebulae and Star Clusters done in 1764. Messier 7 is about 800 light years from the Earth and is comprised of about 100 stars. It is a bright patch of stars that is visible to the naked eye found near the tail of the Scorpius constellation. The latest images from the European Southern Observatory's Wide Field Imager on the MPG/ESO 2.2-metre telescope shows Messier 7 shining like diamonds against the backdrop of a multitude of stars. These bright stars are believed to be close to exploding into a supernova as it is over 200 million years old. 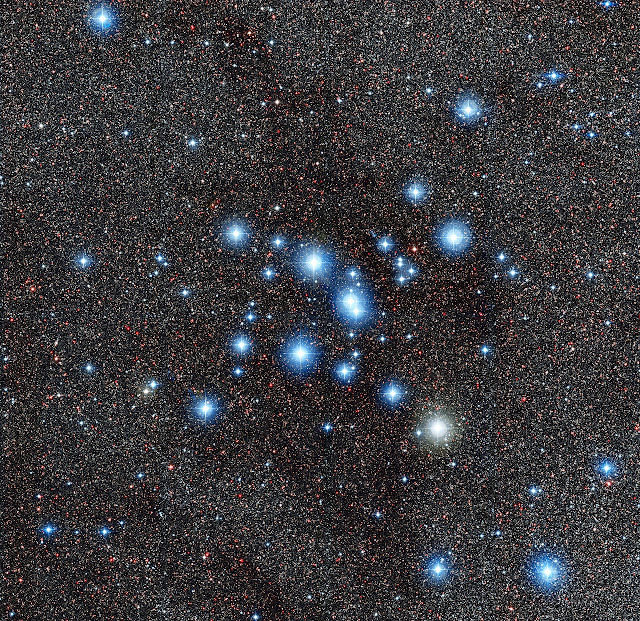 Messier 7 is an open star cluster. Open star clusters are loose clustered groups of stars that are held together by a very weak gravitational attraction to each other.